‘South Africa spends a bigger share of its GDP on education than any other country on the continent. Yet its results are among the worst.’ So began a 2010 article in the finance mag The Economist – which isn’t prone to click-bait. Not much has changed since then. This year and last, the Fees Must Fall movement, led by students protesting against rising university fees and falling standards, made headlines across the globe. Fair to say, South Africa when it comes to education doesn’t have the best of reputations. The school is tuition free, open to everyone regardless of their educational background, doesn’t require matriculation, and almost guarantees a job upon graduation. There is money though. In 2012, South Africa spent a greater proportion of its GDP than Australia, France and Germany on education – 6.4 per cent according to the World Bank. But this money doesn’t seem to be going anywhere. South Africa also performs badly compared with other African countries. A report from the Southern and Eastern Africa Consortium for Monitoring Educational Quality (Sacmeq), quoted in the Mail & Guardian, placed the country’s average student reading score 10th out of 15 African countries. And it doesn’t get any better as students get older. The Economist reported: ‘Just one in ten black pupils qualifies for university, compared with more than half of their white peers.’ The education system is low quality, over priced and racist. Camille Agon, the US-educated, French co-founder of WeThinkCode_, a coding academy based in Johannesburg, thinks she has the answer – or one of them at least. The school is tuition free, open to everyone regardless of their educational background, doesn’t require matriculation (the university entrance qualifications), and almost guarantees a job upon graduation. The school accepted its first cohort of 120 students aged 17 to 35 in May 2016 and is gearing up for the second batch next year. Agon came up with the idea for WeThinkCode_ while on a three-month assignment for the Breteau Foundation, a charitable foundation run by the French entrepreneur Sebastian Breteau, which aims to implement a global digital primary curriculum in developing countries. 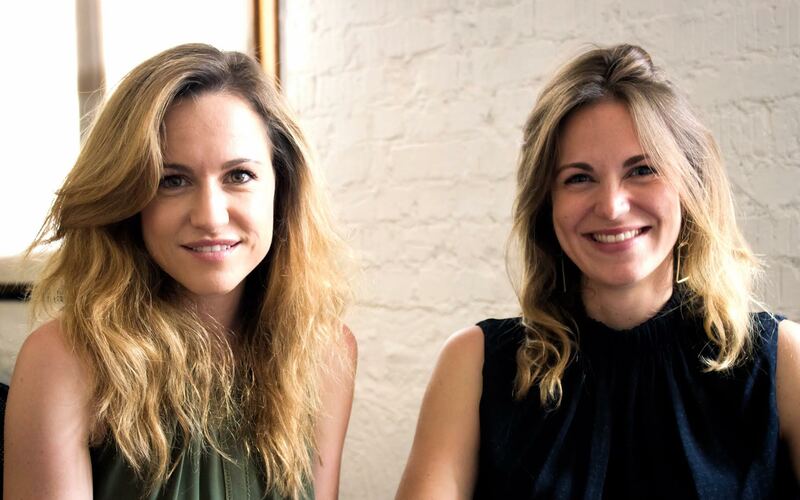 ‘After a few glasses of wine’ at a dinner in November 2014, she and investment banker Arlene Mulder decided that the South African education system was ripe for disruption. In January 2015, she moved to Johannesburg to live. The two young women – Agon is only 30 – planned to set up a school modelled on the coding academy 42, based in Paris and San Francisco, which is similarly teacherless, focused on peer-to-peer learning and free. But unlike 42, it isn’t funded by a benevolent billionaire, rather it’s sponsored by the businesses who reap the benefit of properly trained graduates.At the moment, Agon says, over 3.5 million under 35-year-olds are unemployed, although there are estimated to be at least 70,000 jobs in computer programming that businesses are struggling to fill. It’s a no brainer: 40 companies including big banks like FNB are currently funding and then recruiting from WeThinkCode_. 30,000 students applied for the pilot scheme, which shows Agon says ‘the hunger of young people for educational opportunities’. 60 per cent of those took the test, which 5 per cent passed. 30 per cent of those managed to make it through the four-work intensive bootcamp. They test their capacitude to code, but more importantly they test ‘their attitude and ability to adapt to learning environments’. Some of those that didn’t get through the rigorous test were still hired by companies. The school aims to replicate the demographics of South Africa. Once in, they follow a two-year programme with a specific curriculum – and are given a stipend for food and transport. This makes it different, Agon emphasises, from university courses where students don’t do enough coding over the four years and much of what they learn is obsolete when they graduate. At WeThinkCode_ internships are part of the process, and the students also have five months for a social impact project. It’s this support which allows students to translate skills to the real world, which marks the biggest difference with 42, the French model. Agon runs life skills lessons and organises workshops and speaker visits. The school aims to replicate the demographics of South Africa – at the moment 67 per cent are black. 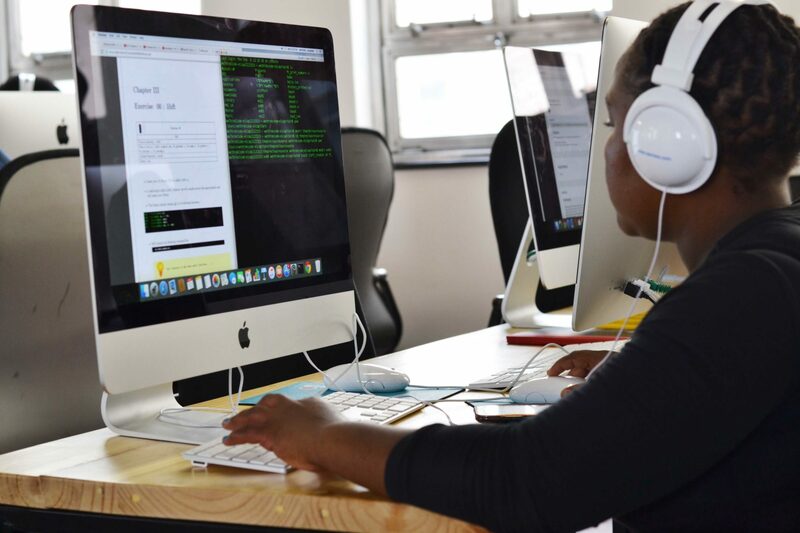 They have an even great challenge with the gender divide – only eight of the WeThinkCode_ students are women. The reasons for the imbalance are depressingly simple: ‘For me,’ Agon says, ‘It’s a self-confidence issue.’ The team is working hard to combat this – by working with other organisations such as Black Girls Code and considering a women-only bootcamp. Plans for expansion are well under way: there will be 320 in Joburg in May 2017; a Cape Town campus will open in 2017; and then in the Ivory Coast. There isn’t a typical profile for students – from former accountants, to university drop-outs, to ex ship welders. Agon doesn’t think she has all the answers, although this new way of education may offer one solution to South Africa’s education woes. ‘Education is not free; it’s extremely expensive. We have to look at many different ways of financing it,’ she says. ‘It should not be the sole responsibility of governments.’ She thinks companies should be part of the process, to offer financial support but also to help shape the curriculum so that students are taught what they will use later on in their professional lives and so that they can network. Check out our @wethinkcode journey so far https://t.co/l1lU7d3IHq To many more exciting adventures! 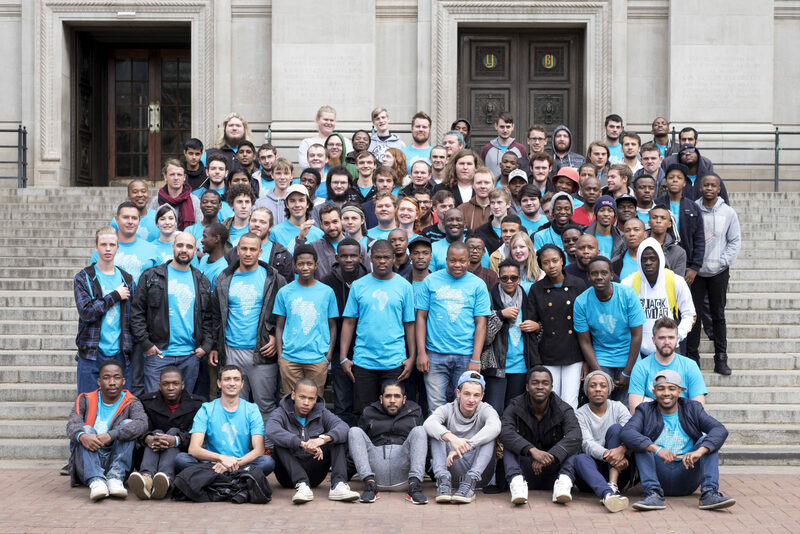 Find out about WeThinkCode_ And make sure you apply!